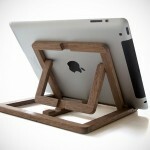 try putting a cushion over your laps and an iPad with a stand on it. it doesn’t stand very well, does it? if the aforementioned is what you like to do, then the Tabi Stand is just the stand for you. with a cleverly designed geometry, the Tabi is equally at home on hard and soft surfaces alike. there’s no metal construction that will threaten your shiny gadget and all contact points are of rubberized material, ensuring a scratch-free and secure grip. at the first glance, the Tabi might look a little strange but it is all about form and functionality. depending on your desired use, you can choose to fit the tablet in either landscape or portrait mode, with or without case and on either side of the stand. one side of stand has a steeper gradient while the other offers a gentle slope. the Tabi is designed in such a way that you can take both the Tabi and your tablet as one, instead of separately when you are moving from one point to another in your home and its lightweight construction makes a cool travel companion. the thing that seals the deal is, Tabi is not just for your iPad, it can fit virtually any tablets or eReader in the market and will work just as well. so if you have a Kindle or iPad mini, the Tabi will gladly carried out its duty. 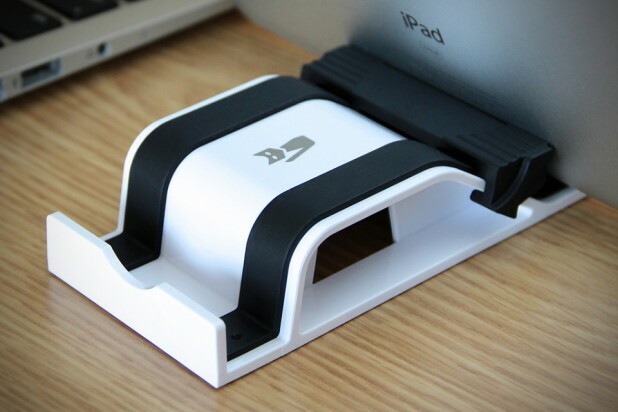 the Tabi Stand is available now for just $24.95 a pop. hit the jump for a few more look.